Don’t you just hate people who claim they are constantly busy and complain that they never have any spare time? If so – being around any of the choir leaders in December 2016 must have been a bit distressing. It’s even worse if you actually are one – our conversations have been bordering on Monty Python’s 3 Yorkshiremen at times. Anyway – on the plus side of all that we had some Christmas fun. We started off with Carols at King’s – Hospital that is – and performed at their Christmas Carol Service. Coming off the back of silent film night, we blew the dust of Coventry Carol and ‘O men from the fields’ and they sounded fantastic. The week after was the 9th Carols ’round Camberwell – on tour – if singing at Peckham Rye Train Station counts. It was a good one this year – it didn’t rain! But it was also really good to support Health Poverty Action, the charity we were raising money for. Check out our special mention here! Choirs throughout London were helping raise money through carol singing and we raised £250. Along with 34 other choirs, the final total was £5,877.66 in a week – an awesome result. Not all choirs squeeze into pubs as part of their carol singing. After the station, we found ourselves in the Phoenix, Grand Union, Hermits (and Theo’s), Stormbird, Tiger and the Old Dispensary. First Choir Rehearsal of 2017 will take place on Tuesday 17th January. In advance and if you’re a choir member – click here for something exciting! Another awesome cheese and wine night everyone! Thanks so much to Carmel who is without doubt the Queen of cheese and wine organisation. Also to everyone who brought something along – be it bottles or brie – and to anyone else who helped in any way. There are, of course, videos courtesy of Dominic – enjoy! Cheese and wine night came after another cracking silent film night performance. ‘Blackmail’ was a huge success – there were confirmed reports of managing to make some of our audience of 260+ people cry – but thankfully due to our singing being so moving! Our rendition of Ella Fitzgerald’s ‘Undecided’ encore at the end soon dried up any tears and the party in the crypt went on ’till late. Great work all round. It’s Christmas carol time now – and we’ll be singing at King’s College Hospital on Monday 5th of December and then at Carols ’round Camberwell on the 13th of December, which interestingly enough starts in Peckham this year. Check the diary for more details – and see you soon! Silent Film is this Saturday! It’s nearly here! Just a few reminders for choir members in advance of the big day..
Tuesday’s Rehearsal will be held in St Giles’ Church. It’s very chilly in church so wrap up warm or bring a hip flask or both. Saturday’s Rehearsal will now be slightly earlier at 5.30pm. We’ll be going through the three songs the band are playing with us and any others if we have time. Doors open at 7pm and the film itself will start around 7.30pm – 7.45pm so there’ll be a break in-between. The bar will conveniently be open. Dress is completely up to you. But 1920’s attire will really make you get in the mood! The choir leaders have heard rumours about certain people’s outfits…we can’t wait. All the band members are wearing fezzes. We don’t know why. After party. It will be the same as last year and probably quite chaotic as usual. If you’re sure you’re coming, give us your name at Tuesday’s rehearsal and we’ll put you on the list. It’s a fiver to get in and there’ll be music and alcohol. ‘Nough said. See you soon – and please tell everyone you meet about Blackmail! Ash & Ags. Autumn has begun – and that means Community Choir is back! Tuesday 13th of September is the big day – and in an astonishing feat of organisation, your choir leaders have updated the choir Calendar up to the end of December, 2016. It has details of gigs and dates for half term and really helpful things like that… Don’t feel anxious – we’re just amazing. Anyway, before having a look at what’s to come this term, here’s an amazing pic of us courtesy of Tom Leighton from Organoke. If you want to see more, visit www.musicatstgiles.com where there’s more evidence of a truly awesome night. Thankfully, all photographs of the afterparty in the crypt bar seem to have mercifully disappeared. So – on to the new term and this is the fourth year we’re going to be accompanying a silent film at St Giles’. This year’s film is Alfred Hitchcock’s ‘Blackmail’ of 1929 – and it’s a cracker. It’s got oodles of Hitch’s signature themes, techniques and motifs running all the way through it – including the blonde in distress, a brilliant Hitch cameo on the tube and a thrilling foot chase set at the British Museum. Blackmail is an especially important film as two versions of it were made – a silent version and Britain’s first ‘talkie’. Apparently the studio asked Hitchcock to convert the film to sound after silent shooting had already begun – but without informing them, Hitchcock decided to reshoot with some roles having different actors – and make two versions. Most cinemas at the time didn’t have the equipment to show the sound version so his justification was, well, sound. Both versions were a hit at the box office with critics favouring the silent version which we’ll be screening in November. Apart from a few different actors, the two versions don’t vary from each other that much – the silent version had a length of 6740ft as appose to the 7136ft of the talkie. But one thing which was cut from the silent film was a song called ‘Miss Up-to-Date’ played and sung by actor Cyril Ritchard who appeared in last year’s film, ‘Piccadilly’. It’s only a short song and the music for it is about 80 years out of print and can’t be found anywhere! But we’ll try and include it back into the silent version, along with a few modern songs here and there. Here’s the original – let us know if you can make out any of the words! After the silent film, we’ll be on the lead up to Christmas and as usual, December is looking hectic. But in the meantime, if you’re thinking about joining us for a rehearsal – do come. Singing in a choir is an amazing experience and it’s really, really good for you! We hope to see you soon. Ash, Matt & Aga. Essentially, we’re going to join in and lead karaoke classics accompanied on the organ in St Giles’ Church, with the help of a band, a bar and some fancy dress outfits. Admittedly, this is not a normal combination and to the best of our knowledge this hasn’t been done before and probably for good reason. But as the opening night of Camberwell Arts Festival on the 11th of June it’s going to be great and definitely something different! We’re working out exactly how it will all work but come to choir to find out more – you never know when the next post will be. In the meantime, check out the calendar which has upcoming rehearsals and concerts and see you at choir soon! This weekend we’re singing at our first two gigs of the autumn term. And due to our amazing organisational skills, your choir leaders – and Carmel (so you know who to blame) – decided that to get an authentic performance on Sunday’s Day of the Dead celebrations we should have our annual silent film night the night before. Obviously this involves an after party in the crypt ’till late which should ensure that we all look and feel suitably dead for the next day. Or later on the same day in most cases if you think about it. Still – it’s going to be an amazing weekend! Our silent film night on Saturday 31st is in it’s 3rd year and with the help of the Friends of St Giles’ Church and Camberwell Free Film Festival this year is going to be epic. Tickets are available on the door of the church for the film. And if you want to buy tickets for both the film and a ‘speakeasy’ theme night downstairs in the crypt afterwards, head on over to wegottickets.com where you can buy combined tickets for both events. The film starts at 7pm – and choir we’re warming up at 6pm in St Giles’ – see Calendar for more details. Then on Sunday 1st November we’re heading over to Hackney for Día de Muertos. It’s being held at the RichMix Cinema, 35 – 47 Bethnal Green Road, E1 6LA and we’re on at 3pm. Day of the Dead is a tradition spanning back thousands of years, where Mexicans honour their dead and celebrate life. And as well as all the celebrations it’s a chance to celebrate loved ones that have passed away. There’s a fully traditional altar, live music, arts & crafts and probably the most deliciously crafted Mexican food on this side of the pond! Check out the Facebook page here. What a weekend – please join us if you can! The roaring 20’s are back – and so are we! Our new term starts on Tuesday 15th of September with Aga. You can see our schedule on the calendar page here. 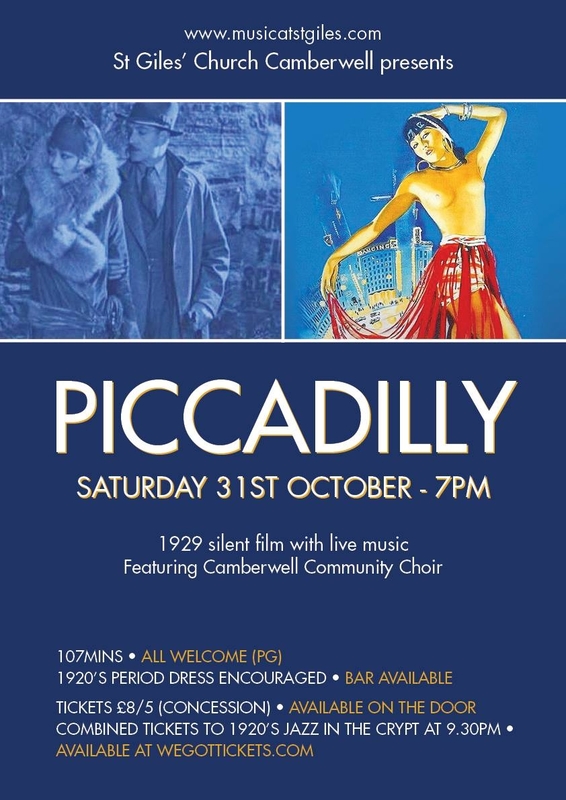 And like last year, we’re preparing music for a visit to 1920’s London with our silent film night, on Saturday 31st of October. In October 2014, we accompanied Alfred Hitchcock’s silent film, ‘The Lodger: A tale of the London Fog’ with live music. We thought we’d stick to the same town and era so that we can encourage even more dressing up this time around. So dust off those fascinators and top hats! Like last time, we’re combining period and new music. Whether we’ll be able to recreate one of the best chase scenes in cinema history to ‘Mad World’ is anyone’s guess, but we’ve certainly got some ideas. 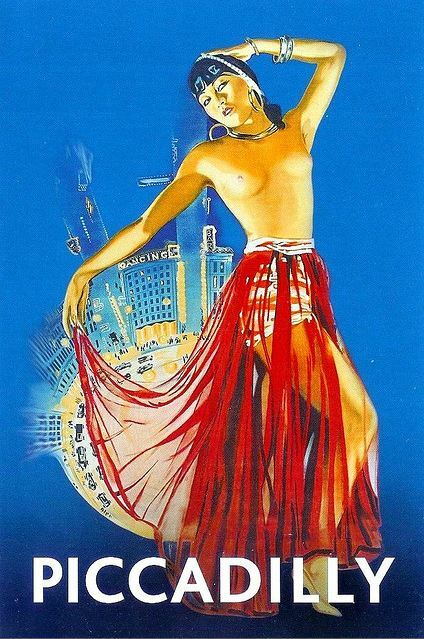 Piccadilly is a film about ambition, desire and jealousy set in the glamorous west end – it’s hugely stylish and we’ll be using the British Film Institute’s restored version to bring it all to life. So definitely a date for your diaries – see you at a rehearsal soon! After learning 6 brand new songs last term we definitely needed to call it a day. And a night! Our spring concert, with a night and day theme, was the finale to a great term of rehearsals. We had lots of new faces, lots of cheese and wine… and we tackled the most difficult music we’ve ever performed, much of it in four parts. 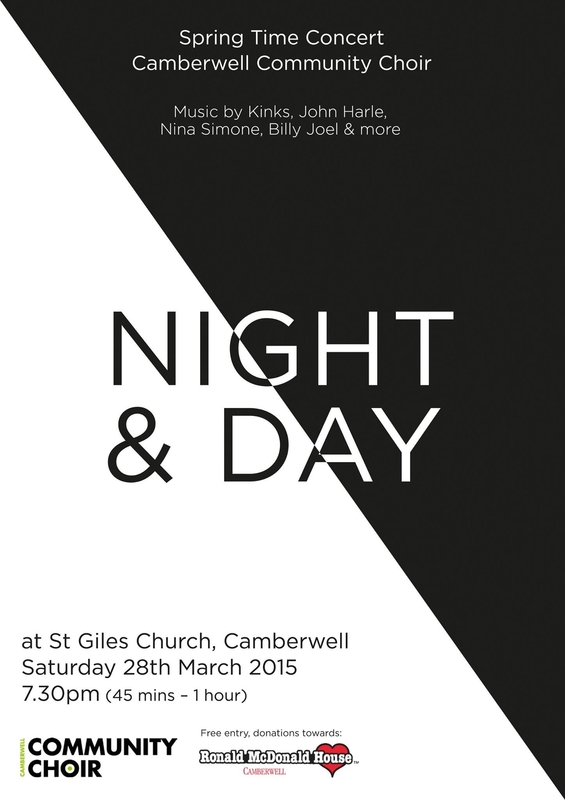 We had a great attendance at the concert and we raised nearly £200 for Ronald McDonald House Charity in Camberwell. The choir leaders even got their act together and stuck to the theme… in the end! We also contributed to a concert with two other choirs on Monday 13th of April – even with lots of people away for Easter we still did a great job. So, what do we have planned for summer 2015? The theme is songs from musicals and we already have lots to put in the diary. On Sunday 10th May we’ll be performing at a garden party at Ronald McDonald House in Camberwell. Then on 20th June we have Masters of Pop II in St Giles’ Church. And on the following weekend on Saturday 27th June we’ll be supporting a world record in Camberwell… more on that soon! Check out the calendar for all details of rehearsals and concerts – and see you at choir soon!